Oh my, your recipe sounds so good. I’ve never thought to use lamb in meatballs – I simply must do that recipe next time I’m making this dish. 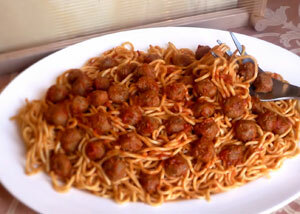 Itali is a beautiful country and spaghetti meatballs is one of the famour recipe of Itali. You did well with this recipe Congrats! Looking forward for more recipe from you. Thanks for sharing. Love it, love it, love it. Very informative recipe. Makes me want to go there myself to investigate. 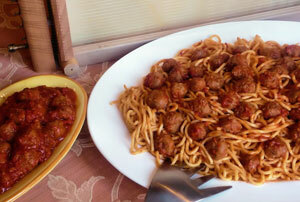 I can tell just by the photo that this version of spaghetti with meatballs recipe is authentic and delicious! I will admit that I have never made meatballs with lamb, but am certainly going to try this recipe next time. thanks for the recipe. you never include instructions on how to incorporate the onion and carrot in your sauce recipe. I’m assuming you saute it at the beginning in the olive oil prior to adding the tomato?